Copy the Station60Ville folder into your …\Steam\SteamApps\common\sourcemods\ folder. Station60Ville should now be listed in your Library tab. The player should feel that this base has been around for a while, but also it should be clear that the rebels have made the best of a bad situation and not built something from scratch. Don’t make this a newly built fortification – make it a re-purposed area/building/location.Ideally, there would be a WOW moment in the map somewhere. There was only one official entry for this mapping challenge. The second entry was past the deadline. Originally, the winner was going to be chosen by public vote, however, Camp 43 was the only official entry, so this won by default, although it is a fantastic entry. Three gridview icons are included in this file. To use the included grid view icon, select “Gridview” in Steam (top right corner). Right click on “Station60Ville” and select “Set Custom Image”. Then browse to the SourceMods folder and then to Station60Ville/steam-gridview-icons folder and select the image. Then click “Set Image” and that’s it. The challenge started 11am GMT 15 July 2015 and finished Monday 3rd August at 12pm GMT. The first 5 screenhots are for camp 43, the next 5 are for Tunnel Dwellers. I can’t deny that I was hoping for more entries, especially with all the chatter in the theme announcement. But, there you are, this is what we have and it’s certainly better than nothing! Below are my thoughts on each entry, be aware they both contain spoilers. Jason is amazing. All his releases are self-contained little stories/events/situations. It’s one of the things I love about his work. Another thing I love is his desire to bring something new to the table with each release or at least make something old feel new. Now, I don’t know if the trick with the generator needing multiple turns is new but it had me stuck for a good 10 minutes. It’s a neat little idea and works well. The second is such a cool idea. In fact, I won’t spoil it for you but this one also took a while to figure out. The general design and layout of the area feels real and the combat is challenging but never overwhelming. The finale, already alluded to, is worth the wait but you need to be in the right place to experience it completely. All in all, almost a Personal Favourite but I really wanted to jump off the antenna into the sea below! Don’t let the initial and occasional dev textures put you off. There is much more to this map than you first see. It’s clear that it’s unfinished, not just from the textures but from the polish and lighting. That said, the gameplay was fun but I saw Combine spawn in front of me, so that’s not good. When you think it’s finished, it’s not, you have one final battle to push you to the limit. It’s a good entry but lacks the completeness and polish that Camp 43 has. I totally took the wind-up-the-generator mechanic from Ihonnyboy’s excellent In Medias Res. It’s supposed to be a push button kind of thing, but having to wind it up just “felt” a lot better to me ever since I saw it in that map. It probably should have rewound itself if you let go, just to give the hint that you’re supposed to keep winding it. I’m sure I made a mental note to do that, but forgot it. Arh, okay. It’s a cool idea but a little more direction might have helped, although, maybe I’m the only one who had trouble with it. I think the most interesting thing about the generator thing is that both of us had the same idea as a mini puzzle sort of thing. The difference with mine though is that I used a func_door instead so that it only had to be clicked once and it would do what it needed to do automatically. If I had only known that there would of been 1 competitor to be up against I would of worked to finish my map. Never mind, my idea was a bit huge and I had a week on holiday anyway. On to the entries. Although short in my opinion, this map was very polished and felt good. I would say that I was expecting the base to be over run by an evil force, hence the dead bodies making me creeped out and ready for jump scares, only to find it was just a combine massacrer, which was anti-climatic. I still thought that something scary would happen, causing me to have a tense moment when Dog came pounding out of nowhere. 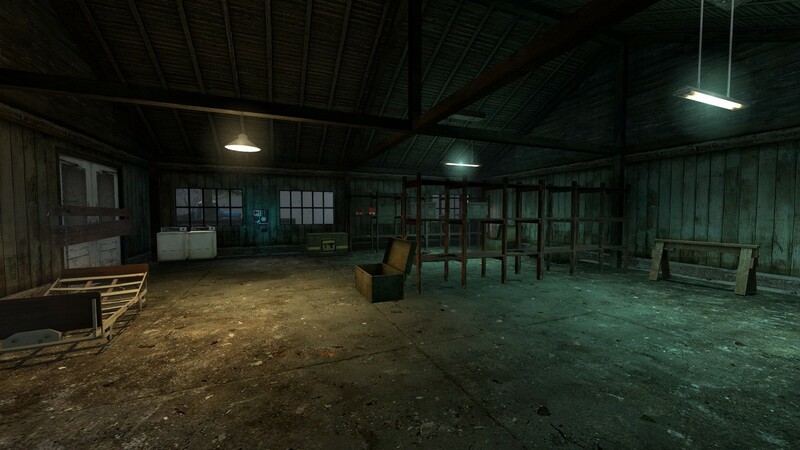 It would of been cool to have cellars to explore too, thus increasing to gameplay time. If it was only 5 minutes longer, it would be as good as Forest Train (and you can’t get much better than that). I will give the map credit for making me claustrophobic in its first arena with zombies, but after that it’s just walk on the next arena, then the next, without any puzzles in between. I know this is incomplete, but the author could at least put a splash screen stating the objective, as after coming back to the rebels quarters I said to myself “Why did I just do all that?”. Well, at least he made a complete map, where my projects tend to flop faster than a cardboard box in a tsunami. Camp 43 was very well done. I ran out of health at the end which made it very tough. How was one supposed to take out the airship thingy? I had to go God mode to finish. Having the dog and Alyx arrive at the end gives it resolution, which was nice. Do you need to give people a little longer to complete the maps, Philip? How was one supposed to take out the airship thingy? The simple answer is no. No matter how long people are given they always want more time. They know the deadline when they start, no rules have been changed, so there is no reason to change the deadline. In the past, I have given more time becasue something changed – that’s only fair. Remember, these challenges are as much about time management as creativity. I have run longer challenges and the exact same thing happens. I understand why you would ask, but trust me, it’s always the same. Station60Ville… or as I think I’ll call it now, GeneratorVille. Since I made Camp 43, I’m just going to focus on Tunnel Dwellers. Despite being obviously unfinished, this was a pretty fun map. Opening with that silly AR3 conversation put me in a good mood. The combat is basically a series of interconnected arenas, each having good flow and lots of ways for enemies to enter the scene. It was weird to circle back around to the starting point – as Phillip says, it’s not over when you think it’s supposed to be, and when you start retracing your steps you wind up in one last battle. It would have been neat if the rebels joined me in that final confrontation somehow – they were awfully nonchalant about the whole invasion. The way they stared at me when I circled back around made me chuckle, like they were thinking, “Oh hai there, where have you been?” But hey, it is unfinished. I liked the twist on the elevator battle where you had Combine and Zombies battling each other. It took something that’s cliche by this point and made it interesting by having the player take sides. I only had a couple negative gameplay comments. One is that there were too many locked doors that were just there for the sake of making the area seem larger than it was. These should either be door textures without handles, or have Combine locks to signal to the player “Hey, don’t bother investigating this.” Second, and this is something that always comes up when you retrace through an area, item crate balance is a problem. If the player comes through and smashes all the crates ahead of time – getting useless things like SMG ammo – they aren’t going to have health or suit energy when they actually need it. They don’t know any better, though. It probably would have been good if the Combine were forced to drop health vials. I wish there were more entries, but it was fun to play nonetheless. This was a magnificent piece of work. I loved the setting, the clever story, and the solution to the problems. It would be fantastic if the author released an entire mod of this quality. this was a little rougher than the first entry, what with the unfinished textures and no real story line to speak of. The best part of this map was the inner conflict with the Resistance members as they are having their discussion. But the map got very repetitive and there wasn’t that much exploring to do. Overall, Camp 43 is the best map and will definitely be replaying this one! But hopefully contests like this can get more entries in the future! Did you mean to use a PLAY IT NOW rec. image for the whole mod? The little one you used is just for each map within a pack and doesn’t count as an overall rating. I meant to give the whole Mod a PIN but something went amiss. Station 43 was a Personal Favorite and Tunnel Dwellers was a PIL. Okay, I’ve fixed it for you. Another great Jason Gimba release! I liked the layout of the buildings, I honestly expected the camp to be larger, but I think the smaller distance between buildings made it feel more unsettling. I also liked the use of fences to make the space feel larger than it was. I liked the locked supply hut. Even though the player is investigating the transmission, I think this gives them a nice game play objective versus a plot one. And finding the gate without a wheel kinda reminds me of the “key and locked door” type of game play mechanic from other games, especially since the “key” is found much later game play wise. I also liked the little hints you get to the reveal. The combine mines, the people dead in their beds. I think I also heard colt’s transmission repeated in the background. I also kept checking the body’s faces. The combat was great too. SPOLIERS The hunters gave me a run for my money, even though there was only two, and the soldiers running around with a standoff was neat (at least I think it was a standoff), the shotgunners still behaved a little funny, but what can you do. I gotta say, though, I was not expecting 4 AR2 combine and 2 shotgunners, talk about a lightning attack squad. I liked it though, the tight fight didn’t make it too bad. (I half expected to combine to start shooting from he fences) I also liked the gunship. You just have this brief moment of “oh no, now what?”, I just ran toward the exit after a bit, than took cover by one of the supports. It is a little gamey how the gunship got hit by the tower, but I guess the only other way to do it is to have the tower fall, and than have the player guide the gunship into it. It’s definitely a different way of taking down an enemy we’re all used to taking down a certain way. A note abut the generator feedback: I remember making the little dial move to give the player that extra feedback of how close they are to turning it on. I wasn’t sure if Jason had done that, but I didn’t notice. I you want I can send you my setup. I give this a play it now, because despite the dev textures, I’m glad it was submitted. Mainly because the combat space layouts were great. The first zombie holdout had this vertical component you don’t see too often, and the side corridors gave the zombies enough cover to sneak around and corner you. The elevator holdout had the edition of combine, I just wish I could’ve watched the fight from a third angle while still being in harms way. I the final combat space was great from a layout perspective too. 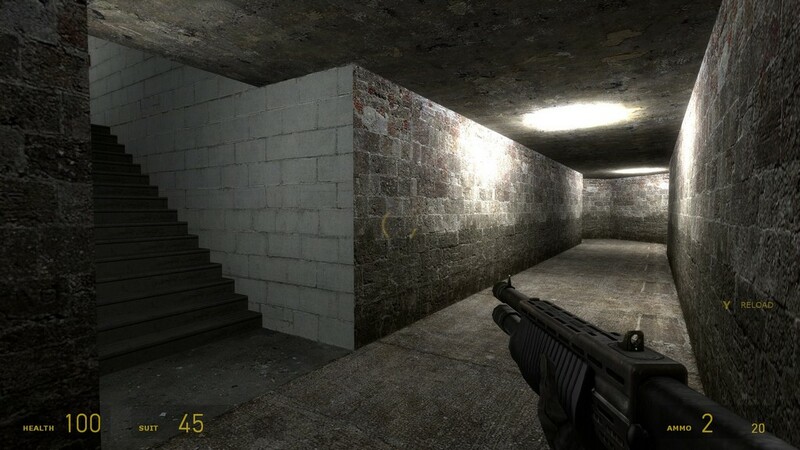 It has a very linear “path” with the way the catwalk is put, but the openness of the space give the player and enemies a lot of tactical options. I just wish there was more resupply and that the combine spawned in different places, or at least they spread out more. Maybe if the author had opened up some of the apartment windows and had the combine shoot from there. The hunter fight was great too. Even thought there was only too, my low health forced me to duck and weave around cover before they flanked me. I made it out of there with just 5 health! With the final battle, that’s something that was actually brought up to me. I had the Beta Testers Collective help in testing this map (just realized I forgot to trigger the end credits, oops), and that’s something which was suggest to me there as well. I just didn’t have the time to do it. Yeah, I had the little dial prop, but I didn’t think to connect it to the crank. That would have helped with player communication. The Combine are on a standoff. The battle with them and the Hunter can play out in drastically different ways depending on how the player moves around. Also, concerning the faces, the implication is that Colton is the Poison Zombie. Camp 43 – Definitely a very well done story, with a slightly surprising twist on it. I liked the idea of having one of the members in the facility kind of betray everything, causing the station to be overrun by the combine before you get there. Answering a fake signal to get the player to the station is a fairly interesting way to introduce the map. The routes around the map for the battle were very well done, and the fact that you take a circular route around the map was actually a rather well though out idea. One thing that did confuse me about the map though is I didn’t really figure out the goal of the map with the chopper. I think I spent about 5 minutes running around looking for a RPG to remove him from the map, as I do every time I see a Gunship. I didn’t realize that you were supposed to have the Gunship shoot the cables that were holding up the radio tower until the Gunship shot one of them. The only reason I found out was being completely lucky and standing behind one of them when the Gunship was firing. This is a very solid and well done entry though, and I had a lot of fun playing. As for my entry, Tunnel Dwellers, I know I didn’t finish the map. I released it anyways, more to get feedback from other people, as I want to continue developing the map. It was probably one of the better constructed maps I’ve made in quite a while, and I tried to make some changed with the way combat was presented to the player in the map, which, with the comments so far, I think I did pretty in that aspect. Some things though, like the story of what’s going on really weren’t present in the map, as I didn’t have enough time left to actually take care of those aspects. The story was to be that the outpost here was like a spy outpost. The different members stationed here listened in on the combine radio chatter so the resistance could better plan around different assaults and other events. Someone cut off power to the facility though. It therefore was running on a backup generator and they didn’t have enough power to listen in on the combine radios. Your adventure relied on going down to the generator room and turning the full power of the facility back on. 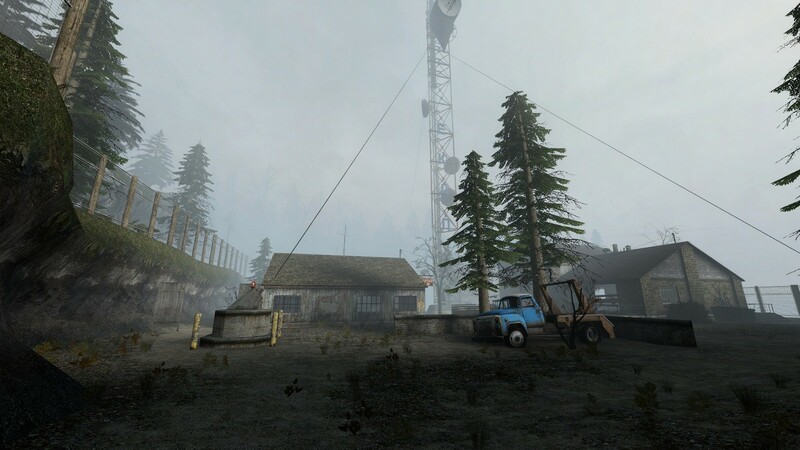 When you get down there though, the combine, as the ones turning off power to the generator, are there to provide a distraction while they plan to assault the base. That’s enough for me to get the map. I know I will enjoy it. Jason has proven himself in the past. Fun guaranteed. This was a nice little release, I enjoyed myself! Sorry to see people ran into trouble finding the time to enter. My own initial, vague notions never yielded to further development, unfortunately. The generator being a momentary button is something I’m sure I’d have picked up on eventually, but as has been noted, if it slowly reset after you let go it’d have been more consistent with HL2. I do agree it feels a lot better to hold than to just use. The handle has such a large radius, and typically moves slowly enough, that the rotating motion is really exaggerated, and activating it with only one tap of a key doesn’t feel right. I especially loved the contrast of a giant radio mast planted smack dab in the middle of such a cozy outpost. As for the ending, I’m with Phillip, I really would have liked to clamber along the tower at the end. Or maybe have Dog make his entrance by jumping up onto it? I don’t know, I feel like somebody should have ended up on top of that thing by the end. All in all a neat, compact little story, congratulations! Unfinished, yes, but definitely going in the right direction. Really satisfying layout to explore, I like all the nooks and crannies. Maps with enough loops to pull enemies through turn combat into a ballet, I find everything gets a lot more fun when I can move around. I do feel like the walkway in the courtyard, where you fight the Hunters at the end, could stand to lose a couple sections of railing, particularly on the side without the stairs. Feels a little claustrophobic, I think it’d be nicer with some quicker access routes away from the combat. Thanks for submitting the map even though it’s not done yet! It’s fascinating to see this stuff in earlier stages, and when the gameplay is sufficiently developed it’s fun even if it hasn’t reached the polish level you’d like yet. Great work so far, now go get to work finishing it! I kind of expected more entrys but at the same time i feel guilty for not finishing mine. The is overrall very enjoyable but i had some minor issues with it. First off why is there a vending machine in the middle of the woods? Also some of the triggering on the desctrucables where a little off. Im not sure if this is 100 percent correct but it semt like only certain enemy types could destroy certain objects for example i found myself getting shot at by the combine throu a window which wouldnt break. But later the airship seemingly smashed the glass in one shot. I dont know if it was intentionell (it probably wasnt) but the AI did not correctly respond to breakable objects. These issues might have just been on my end thoe and i dont think nobody else gave any care about the vending machine (which is still bothering me). On the bright side the map was very good looking and beatifully handcrafted. The Area felt designed for the combat the enemy variety wasnt huge but it made it easy and quick to deal with the threat. The inventive use of the Airship was a realy nice touch. And the ‘Cutscenes’ where well made and they did fit in and gave a sort of meaning to killing a bunch of combine in the forest. This map nearly got a personal favourite from me but the vending machine… not cool. The thing i disliked the most was probably the very basic lighting (please use light_spot in your maps). Also the Navigation did make sense to me. Wait i came from here and where are these combine spawning from? Also Why did we walk throu here before whitout any problem and now there are Combine Everywhere. Also the Enemy Spawns where terrible. I was looking at the corner, looked away, turned back again anda bloke warped into existence, about 3 times in a row. Atleast i didnt had get so nitpicky on this map then on the other. Otherwhise the comabt zones felt thought throu and cohesive (except for the spawns. spawning a zombie behind you on the press of a button (twice) is not fun). The map also gave me alot of freedom with the zombies since mostly there where combines and not killing your enemies was a valid option (since its always fun watching an NPC getting obliterated by a bunch of Zombie Grunts). Overall quite fun but far from perfect. 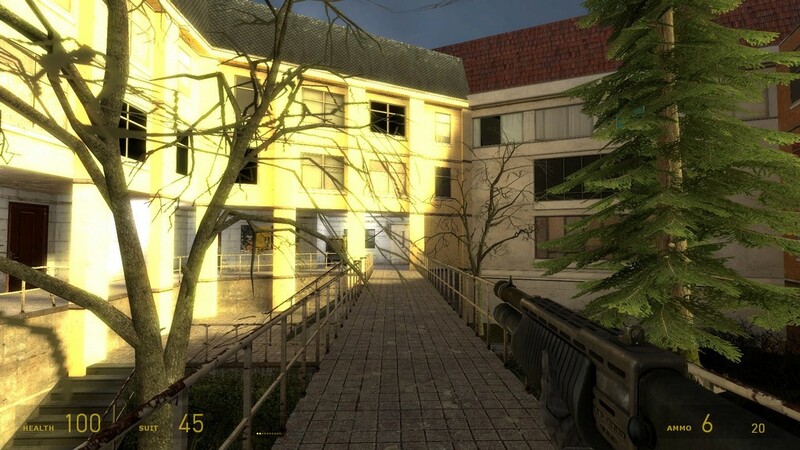 But would the perfect map still be fun? I dont think so. It’s a Jason Gimba map so the question isn’t “is it good” but rather “how good is it?!”. Personally I felt this one was good but not great. Visually it was fantastic and has that JG quality presentation that so many other levels lack. The level starts off good but I thought it lacked build up and pacing in the combat sections. It was never bad, but I didn’t really get excited about anything I did while playing. The mechanic for taking out the Gunship was cool but I thought I had to shoot or blow up the cable ties myself rather than let the Gunship do it for me. I sort of found out by accident that the Gunship would do that! A nice touch was that the cable ties groaned as you approached them in the intro which drew your attention to them! These maps were both pretty good in their own right, although camp 43 was in another league. I would say the first map was most immersive while the second most energetic. Camp 43 absorbed me quickly, the initial video recording seemed to add a huge amount to the map, giving a story to get immersed in instantly. The atmosphere entering the camp was nicely crafted, and tension was built up over time. The puzzle were not amazing, but they played a good role in pacing the map, and building the tension in such a small area. The combat was interesting, obviously it’s the same old combine and hunters routine, but it was still enjoyable because of the tension the map had built up. I was thinking it would have been nice for the hunters to chase the player back through those small buildings instead of staying outside so much. That’s ok, overall it was an immersive little package, I would definitely recommend it. Tunnel dwellers did not start out well, with dev textures in the opening area, but soon got more detailed which was a relief, although I’m not particularly against dev textures. It was a symbol that the map wouldn’t be amazing. The strange looking stairs and architecture, and a prefabricated set of combine talking about AR3’s showed that it was a newish mapper, so that gave them a bit more slack when playing the rest of their map. Some areas had lots of intricate pathways and some areas seemed to be meticulously designed, however there seemed to be very little purpose to each section, unlike the buildings in the first map which each had some sort of role. Supply crates and weapons seemed to be strewn around the map randomly, on the floor and around the corners, which was ok for gameplay (better some than none) but a bit odd. These things do the opposite of immersion, and I end up attempting to speed run the maps and combat, and find a way to the goal, but I realised usually the goal is to wait for the music to finish and to kill the combine until they stop spawning (one spawned behind me while I was in a sealed room). Tunnel dwellers ended up being quite tough at the end, but gave me a good smile when I was on 8 health and a hunter turned the corner right next to me and I shotgunned it, and the screen faded to black. 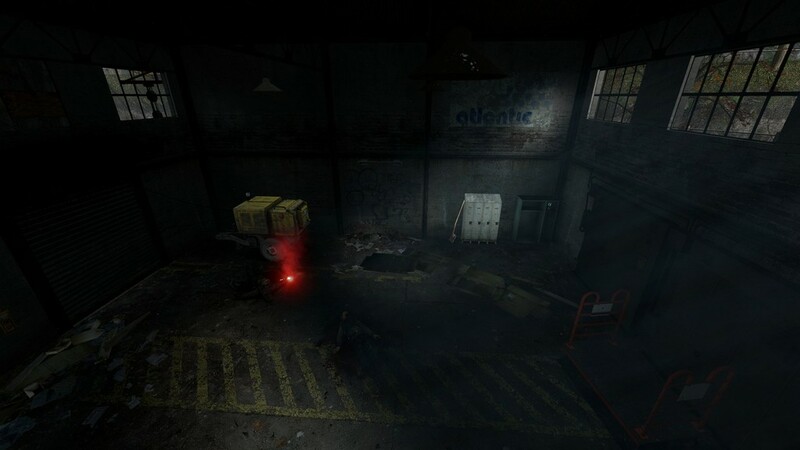 However, overall I would say a lot could be improved, such as more varied combat (not just pitting the player against a horde of respawning zombies or combine), some form of story, even small environmental clues to give areas purpose, pacing – giving the player a rest after lots of combat, e.g. exploration even in a simple puzzle area (not putting the handle right next to the generator (this is a great comparison with the two maps)). People playing these maps will have already learnt that puzzle, you don’t need to teach them again. I’ll make a video for everybody this week. Very much enjoyed this, very well made map despite having to negotiate hopper mines and a poison zombie armed only with a crowbar. Think I spotted a major bug though which I am surprised nobody else has mentioned. After triggering the gunship I soon realised that it was the idea to let it shoot through the tower support cables but unfortunately ran out of health just as the last one was hit. Luckily I had been quick saving during the battle and reloaded the game at a point before the second cable had been shot through. I was surprised to find that the ship was still there but no longer firing at me or anything else. Basically it was just floating around in the air. I did another reload slightly further back after the ship had appeared but before it had shot through anything and the same thing happened, the ship simply did not fire. Finally I reloaded at a point just before the last combine was shot and the ship appeared for the first time, this time it was firing on all cylinders and I was able to complete the level. Would welcome confirmation of this from other players or Jason. Good fun especially with the zombies but as others have said there were far too many locked doors so you spend a lot of time running round trying them all for no reason. Also agree that the spawning enemies spoils things somewhat as there is no logical reason for some of them to be there. At one point there were zombies coming down a staircase from a room where the door was permanently locked. On retuning to the briefing room I almost thought that the game had ended as there was no prompting to go back out to the courtyard. Maybe a word from one of the rebels would have been good at this point and certainly it would have been great if the rebels had helped in the final battle. I was able to recreate this problem. Unfortunately, I have no idea what causes it. It’s like the Gunship’s AI went to sleep. It doesn’t respond to anything. This entry is a quick solid piece of work. Though the combat in my opinion passes very quick and you know ends pretty sooner than I expected. The cherry in the cake is that awesome final sequence where you kill the strider by making him shoot at the anchors of that big antenna. Indeed that took me a bit to figure out but it was a very well done environmental combat puzzle. The voice acting is outstanding and the whole plot is pretty clever! I never imagine Cap. Joey, was a dirty traitor, I felt glad when the CMB kill the dumb arse… But sad as the whole resistance members got killed by his fault, and ironically it was the perfect trap for Gordon to get ambushed and caught…. You know the whole story is just sweet into the HL2 universe and I liked that. The final combat arena is challenging and the combat is fun, that’s the only part I liked about that one, overall is a shame that it’s unfinished. You know, this is the case of one competition with just one solid entry, that actually saves the whole competition. 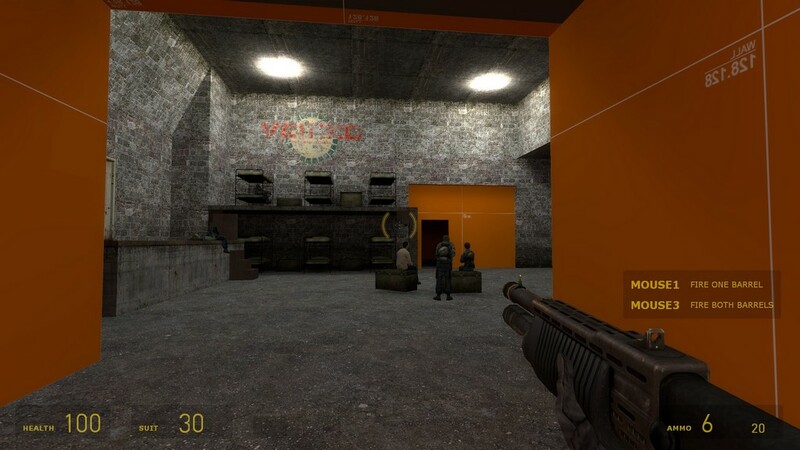 Although I feel is quite a shame, that this cool theme into the HL2 universe, had just too few entries. I hope in the future we have better and more entries. Some good visuals and a really effective use of the rebel base as a gameplay space. The ending is ridiculous but awesome! Really nice work. It had potential but it’s very unfinished and would need quite a lot of work to be really something worth recommending. At the moment it is really just a few simple combat areas connected haphazardly together. I would have liked to see more entries with this theme, since I think you could do some interesting things with the idea. Two entries only, well I didn’t enjoy a lot of this competition, but its still nice because I am a big fan of the half life series. well this entry probably is going to win already because its complete, but I enjoyed the two entries, the strange thing is that when the leader told the combine there location that was kind of unrealistic would you trust them? I won’t. now the author didn’t have time I think to finish the map, but I still enjoyed it, but you know not to the death, I enjoyed the combat parts. I really don’t like the fact that the amount of entries per competition is starting to decrease. It’s a shame that there are only 2 entries for this competition. Despite that fact though, I had quite some fun with both entries. The only true entry in this Ville, this map was really fun to play. For a single map, this is very impressive for a lot of reasons. First of all, the environments look amazing. 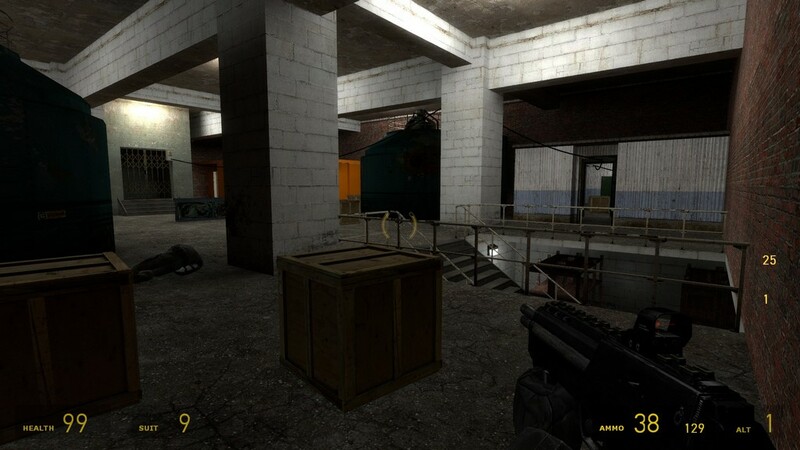 It feels and looks like something Valve made – the visuals are that good. The gameplay was really fun and the combat was great too (even though it was very easy). There’s also an interesting back-story about the guy you see in the beginning, but I’ll leave the rest for you. The fight with the Combine gunship is incredibly clever and I want to see more gunship fights like this in HL2 maps and mods. Overall, this entry for me is the winner, obviously. 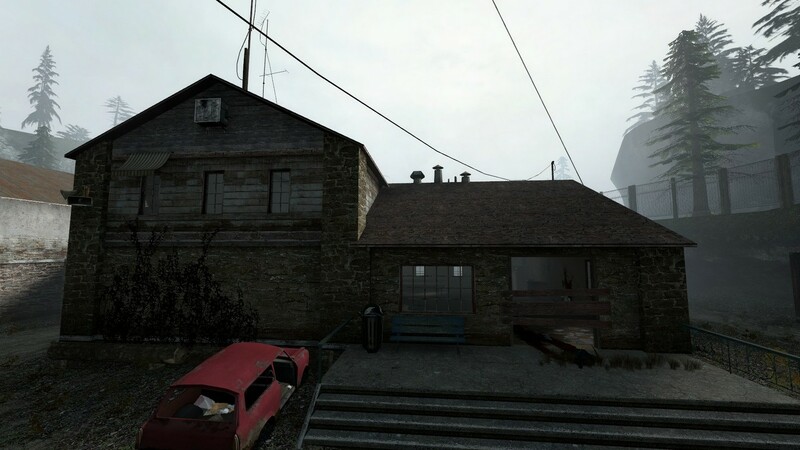 It’s incredibly impressive for a single HL2 map. If it was a bit longer and a bit harder, this would get a PF. Even though this is a late, unfinished entry, I had quite some fun with it. Sure, the mapping and the lighting in some places is crap sometimes, the combat can be unfair and there isn’t a legit ending (I couldn’t find one), but as I said, I had some fun with it. The part with the zombie horde was incredibly boring however and this map could have survived easily without it. Overall, I would recommend this map, but the choice of playing it is up to you, due to the fact that it’s unfinished and unpolished. If you want 5-10 minutes to spend, then this is the map for you. Oh crap, I forgot to put the PIN rating. Is there a way to add it somehow? And by magic it suddenly appears on your review! No, there is no way for you to add it to an already posted review. You could post a new review with it though – just for future reference. I am happy to add it though. And stumbled upon the fix to that gunship if I’m honest. This is really well made, excellent map. Well, it’s okay and I enjoyed the invasion part in the near dark. Just enough, wouldn’t have wanted it darker.. too scared! Okay, it’s obvious it’s not finished but I didn’t get certain parts, like after the elevator part! Odd.. Thought it also needed more ammo / health after this part. Or perhaps that’s because I died here?!! Hmm it’s good but feels rushed. Camp43 far better. Loved both maps. No problems under Linux. The map has a really interesting scenario both in story and in gameplay, it has a good setup for both, I don’t really have much to say about the map other than to give it praises, the simple environmental puzzles were good and well used, the combat gave you a lot of choices and the story was interesting enough to give the place an context which helped the map a lot. I really want more of it. It’s obviously unfinished as stated on the article above, but the map was decent enough, simple and intuitive map design, good use of the puzzles too and some decent to good fights, maybe a bit too dark at times considering it wasn’t going for a scary theme, although made one fight slightly harder, I think it could be a great mod if finished. The only negative point really is that the whole scenario was uninteresting, some context and some prettier locations would help it a lot. Too bad the turnout on this challenge wasn’t better – I thought the theme was clever but perhaps it was too open. Regardless, the pair of maps in this pack is solid. Yes, another JG map means another good time. I loved the creepy atmosphere of this one. The fog is a nice way to enhance the mood, even making the outpost a bit claustrophobic. I have to say I really like the quiet before the storm that this map has. It’s great just having the ability to explore at your leisure, trying to work out where to go and even what happened before you got here. The best part is that it’s not totally safe and quiet – the hopper mines startled me nicely. It reminded me a bit of the one empty house on Highway 17 where you can just hear the wind, and then a couple of the roller mines jump out. Made me jump out of my seat. The puzzles were pretty straightforward fare, and if you explore a bit you’ll make quick work of the enemies you encounter. The end battle had me scampering around until I had the ‘aha’ moment. Nice twist on a common finale without making it gimmicky. Overall a really fun map. Unfinished, yes. But this map is still pretty decent and it’s easy to see it as a good entry given some polish and minor improvements. It’s fun to make your way through and although I enjoy a zombie ambush as much as anybody, it did feel a little cheap to have them come from seeming nowhere. I do like the combination of the slow and (relatively) low threat zombies coming while you’re busy looking for a crank handle. A little more intense elevator section and some more polish and as I said it’d be a solid entry.